Automated Guided Vehicles (AGV) are used in a variety of industrial, commercial, and healthcare applications. This robotic technology allows for efficient transport of Unit loads between multiple load and unload points throughout a process. There are several methods to define paths that Automated Guided Vehicle systems travel ranging from wire to chemical strips. 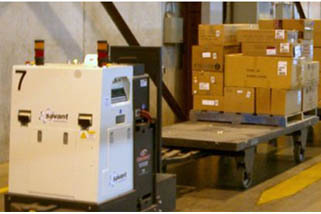 AGV material handling systems can be engineered to handle various unit load sizes and weights. Contact us today for more information on AGV warehouse systems!